This is an almost forgotten and an authentic konkani dish. For me this is a nostalgic one. This was my bappama’s ( dad’s mom) one of the fav dishes of monsoon. she loved to eat jackfruit seeds in any forms like sannthani(boiled jack fruit seeds dried in sun light), fried ones or in curries etc.. I don’t think todays’ generation like it or not. I think it’s almost forgotten now. Magge tamboor its prepared from Mangalore cucumber (vellari in Malayalam) with jack fruit seeds, garlic and red chilly tempering. 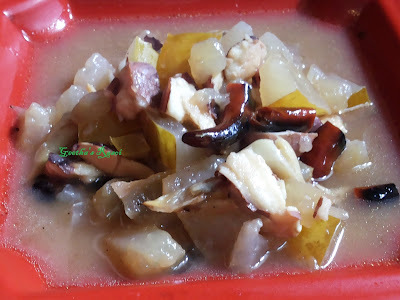 Its not a spicy dish but its gives a little sweetness of jackfruit seeds and aroma of garlic. When I was a kid my bappama used to prepare this for me. After I come back from school I used to eat this like asoup. I was never tired of eating this Tamboor. My friend gave some jack fruit seeds so I planned to prepare this forgotten dish magge tamboor. Cut cucumber into small pieces. Crush the jackfruit seeds, remove the white skin and pressure cook to 3 to 4 whistles with cucumber and salt. Transfer this into a vessel boil it for 2 minutes. In a seasoning pan add oil and add crushed garlic fry till brown then add chopped red chilly for two minutes pour this on boiling cooked cucumber mix. Magge Tamboor is ready to eat.